Last week I pointed out Tim Lohrentz' blog The Indigenous History of El Salvador, with information about El Salvador's early indigenous peoples. We are learning more about these ancient inhabitants of El Salvador through archeological excavations, such as the one at Cihuatán. A thousand years ago a giant metropolis flourished in what is now El Salvador, rising from the ruins of Maya civilization. The city of Cihuatán has long remained Central America's least known and most spectacular treasure. Now an archaeological project will attempt to unlock its secrets. This web site will document what we find, as we find it. Whether you hope to visit Cihuatán yourself, or only to follow our progress on-line, join us as the project unfolds. 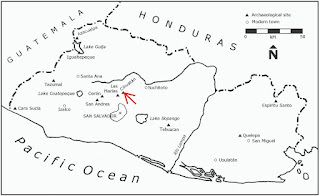 The project at Cihuatán is a joint project of El Salvador's National Foundation for Archeology and San Francisco State University. At the Foundation's website you can learn more about Cihuatán and other archeological sites in El Salvador. In San Salvador, you should make sure and visit the David Guzman National Museum of Anthropology with exhibits and artifacts from the archeological sites. (Tip -- you can ask for an English language guide at the museum if your Spanish is not good enough to read the descriptions on the exhibits).